Seventh-day Adventism emerged out of the social and religious turmoil of mid-nineteenth-century America, an era that also produced, directly or indirectly, the Latter-day Saints, Christian Science, Jehovah&apos;s Witnessess, and Pentecostals. Like most of these groups, Seventh-day Adventism had a charismatic figure, Ellen G. White, who shaped through the twentieth century. Although a dynamic, if relatively small, entity on the religious scene, Seventh-day Adventism has a history that is neither well known nor well understood. This situation has resulted largely because until recently Seventh-day Adventists, who look to an imminent Second Coming of Christ, have taken little serious interest in their history. Written by Adventist scholars who felt a need to better establish and understand their denominational identity and the foundation of their theological beliefs, this book offers a comprehensive, nonapologetic history of the denomination. Accurate in scholarship, comprehensive in scope, and objective in tone, it synthesizes present knowledge of the history of the adventist church in America, and lays the basis for further investigation. In this revised edition, the editor has corrected minor factual and printing errors, revised the language for clarity, and updated the information regarding the Merikay Silver case. The bibliographical essay and the notes on contributors have also been updated. Otherwise, the volume is the same as that published in 1986. 520 Summary $a Summary, etc. 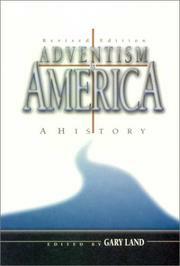 note Seventh-day Adventism emerged out of the social and religious turmoil of mid-nineteenth-century America, an era that also produced, directly or indirectly, the Latter-day Saints, Christian Science, Jehovah&apos;s Witnessess, and Pentecostals. Like most of these groups, Seventh-day Adventism had a charismatic figure, Ellen G. White, who shaped through the twentieth century. Although a dynamic, if relatively small, entity on the religious scene, Seventh-day Adventism has a history that is neither well known nor well understood. This situation has resulted largely because until recently Seventh-day Adventists, who look to an imminent Second Coming of Christ, have taken little serious interest in their history. Written by Adventist scholars who felt a need to better establish and understand their denominational identity and the foundation of their theological beliefs, this book offers a comprehensive, nonapologetic history of the denomination. Accurate in scholarship, comprehensive in scope, and objective in tone, it synthesizes present knowledge of the history of the adventist church in America, and lays the basis for further investigation. In this revised edition, the editor has corrected minor factual and printing errors, revised the language for clarity, and updated the information regarding the Merikay Silver case. The bibliographical essay and the notes on contributors have also been updated. Otherwise, the volume is the same as that published in 1986.